As of this moment, I have $38.60 in my checking account. Almost $10,000 in credit card debt. Very little savings, and if I had to retire tomorrow, well, those would be some lean years. Sometimes, I wake up at night and feel my chest tighten around my heart as I ponder how in the world I will ever pay my bills. I know that many of us feel this way. I hate money. I hate the way I let it creep into my decisions and influence my faith. I hate the way I grasp control of it back over and over again with my inky tentacles. But one thing this dream living has taught me is that money – while necessary – is not the determiner of dreams. Today, as we end the month, I have just enough cash in checks and Etsy sales to pay my first two bills of December. Just enough. I would love to have more. I’d love to have enough to pay all my bills, take care of my school debt, and give away uber amounts of cash to people and organizations that deserve it. But I don’t have that – I have enough. Many of us, though, don’t have enough. Right now, in the world 925 million people are hungry. I can’t even begin to fathom that number. I can’t even begin to make sense of why that is. If I have enough, why don’t they? I have a lot of questions for God about that one. What I don’t have any doubt of is that I am called to help, in my small way. I can’t fix this problem – if I think I can, I’m just going to muck it up and get it inky. But I am called to help . . . somehow. That’s why, on December 22, I’ll be at the local food bank distributing Christmas meals to the hungry in my community. 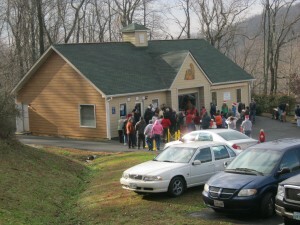 That’s why, in December, 10% of all the proceeds from my writing work will go to the Nelson County Food Pantry. That’s why, I am committing the month of December to understanding how I can act more systematically to help bring an end to hunger. So will you? Will you join me? If so, please say so below. I believe in accountability – that words have the power to firm up our commitments. I’d love to fill this page with commitments and then see how we, The Whisperers, can help to alleviate poverty in our generation. What do you think? If you have enough, will you join me in helping those who do not? I’d be so grateful. Tomorrow, my first published book God’s Whisper Manifesto: The Makings of a Dream comes out. In it, you’ll see that part of my vision for this farm is that it be a place to really help people. If you’d like to read more about this vision, you can sign up for my newsletter (in the upper right-hand corner of this page) and get a free copy of the book. Or if you’d like to financially support the vision of this farm, you can buy a copy through Barnes and Noble and Amazing, knowing that 10% of all those sales will help people in my community and yours. Thank you so much for joining me in this journey. I am forever grateful.